The Vision Grills Professional C-Series kamado charcoal grill has refined the Kamado design for grilling, baking, steaming, and smoking. This ceramic grill is constructed of high quality metals for durability and all-season ceramic exterior and firebowl to ensure efficient heat retention. The Vision Grills kamado offers a two level stainless steel dual flip cooking grate for a total of 604 square inches of cooking area. 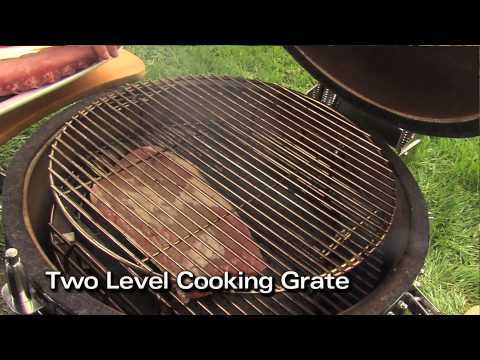 The grates have hinges so you can easily add more charcoal or wood chunks for smoking. The lava stone sits on the bracket to diffuse the heat and prevent flareups for indirect cooking and baking. Located on both the top vent and in the bottom, the Pro Zone control knobs give you total temperature control, from the low slow-smoking all the way up to the blazing heat needed for grilling and searing. The temperature control center also comes fully equipped with an extra large pull-out ash drawer, an easy-to-read thermometer with cooking zones, and an electric starter and electric starter port that allows you to insert an electric starter to light your charcoal. The dual assist hinge allows you to lift and close the lid easily. The cart comes complete with four heavy-duty swivel casters (2 locking) and fold-down wood side shelves to add workspace while grilling. This grill comes with an included vinyl grill cover, lava stone with bracket and electric charcoal starter. Cooking Grid Dimensions 18 7/8 X 18 7/8"
Vision Grills have a lifetime warranty on all ceramic parts, five (5) year warranty on all metal parts, one (1) year on the cover and ninety (90) days on the side shelves and temperature gauge. Found this model on end of season closeout from a big box store at clearance price. Snatched it up and sold my much smaller Green Egg. After 2 years the side tables fell apart. The 3rd year and the interior ceramic insert cracked. I like to cook my steak really hot and often use a industrial air gun to blow oxygen to get a really red hot coal bed. So the extreme heat may had caused the cracking. Now into my 4th season and the best feature has failed. The pull out drawer for ashes has rusted and swelled in size. It's now too tight to slide in or out. It was left outside and not always covered. So most of the rust issue is my fault. I've since built my own wood tables for the sides. I'll find a metal shop who can make a stainless steel ash drawer. 1 Inch 1/2 Inch -- 1 1/2"